While it is well known that the senior population in the U.S. is growing rapidly, the impact on the broader healthcare system and specifically the emergency department (ED) has received less attention. 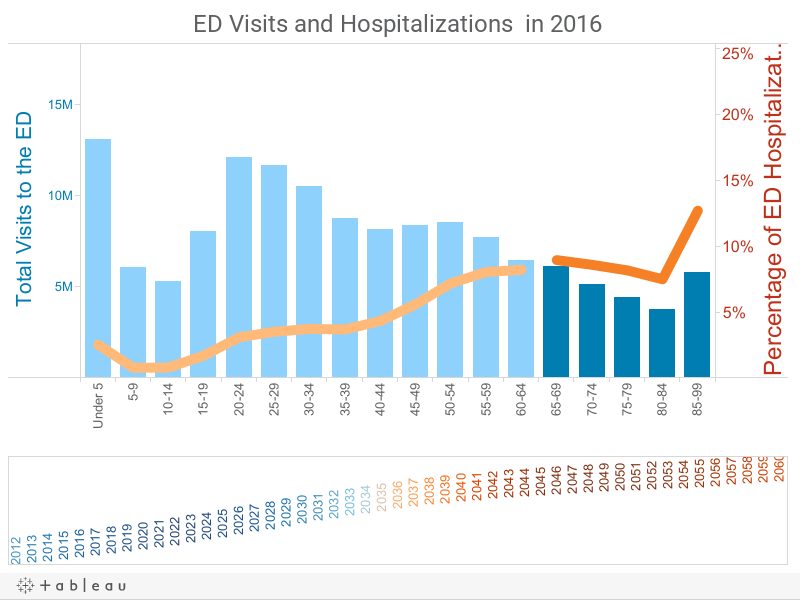 Although seniors comprise a small portion of all ED visits (16 percent), they make up 43 percent of all hospitalizations originating in the ED. In addition, the U.S. Census projections, estimate the number of seniors will nearly double by 2050, making the role of the ED increasingly important. This large demographic shift provides an opportunity to the way seniors are served in emergency settings through specialized care protocols and services. The West Health Institute and West Health Policy Center are working together to address this unique opportunity through an exciting collaboration with UC San Diego Health, a leading academic health system. San Diego County had more than 374,000 seniors in 2012, however, that number is expected to double to 724,000 by 2030, according to a recent San Diego County Senior Health Report. Hover over the dates above to see projected senior ED visits and admission rates. In 2012, seniors accounted for 16% of ED visits and 44% percent or 8.2 million hospitalizations from the ED. By 2030, projections show seniors will account for 24% of ED visits and 56% or 14.1 million hospitalizations from the ED, highlighting the need for innovative alternatives to address the healthcare needs of the growing senior population. Source: West Health Institute analysis of 2012 data from the Nationwide Inpatient Sample and Nationwide Emergency Department Sample, Healthcare Cost and Utilization Project, Agency for Healthcare Research and Quality.